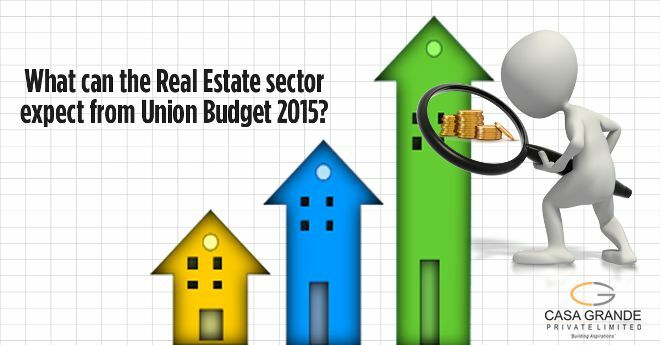 With the Union Budget 2015 round the corner, there is a lot of hope for positive reforms among people in their respective sectors and real estate is no different. The developer’s community has like always surfaced with its pre-budget expectations and are hoping that things will be as expected on the D-day. Here’s a look at the reforms that the industry is expecting from the budget this year. Reduction of multiple taxes – At present, when it comes to buying a property there are numerous taxes that the consumer has to pay. These include service tax, Value Added Tax (VAT), stamp duty and registration charges (as high as 6% which needs to be reduced). It would come as a welcome reform if the budget reduced the burden of at least one or two of these taxes from the consumers. Affordable Home Loans – The interest paid on home loans at present ranges from 10%-11% which is highly demanding especially for middle class consumers. Reform that brings the interest rates in the range of 7% to 8% (which many experts believe is acceptable) will come in as a huge relief for consumers. Impact of Inflation – It is believed that the current skyrocketing prices of properties is primarily due to Inflation. The fluctuation in the cost of building materials like cement, concrete etc. has often lead to the forced price rise of properties. Measures to regulate these oscillating prices and standardizing the rates can help keep the prices of these materials under check. Access to cheaper funding – Foreign funds have been keeping away from Indian markets mainly due to lack of transparency and regulation. Simplification of rules surrounding Foreign Direct Investment (FDI) in real estate and reduction in taxation of Real Estate Investment Trusts (REITs) and Infrastructure Investment Trusts (IITs) can help attract cheaper foreign funds which is a key aspect the budget is expected to throw light on. Incentives for green norms – When it comes to green homes/projects, developers often face the problem where buyers aren’t ready to pay extra for their homes. This in a great way hinders and makes builders reluctant to move into this segment. The budget should allow special concessions for developers following the necessary green norms to help promote green projects across the country. Planning for Smart Cities – The ‘Housing for All’ scheme that the government has announced will pave way for development of smart cities across the country. A workable and streamlined LARR (Land Acquisition, Rehabilitation and Resettlement) bill with relaxed rehabilitation clauses, if presented in the budget, can help achieve this landmark.